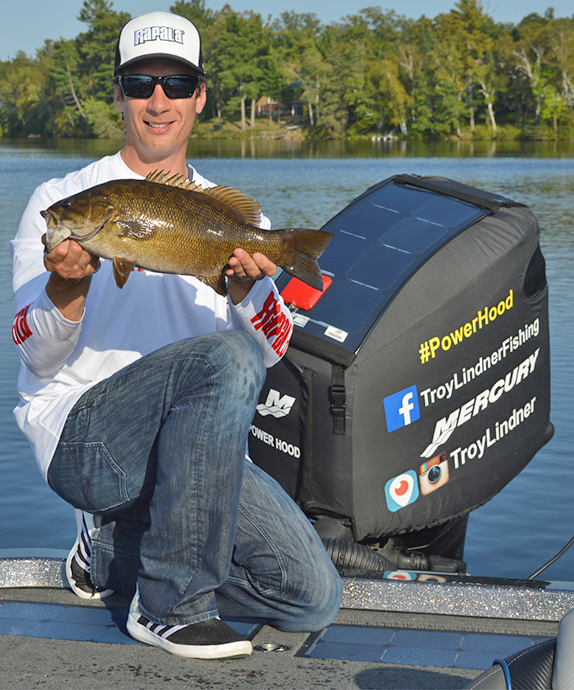 Between solar panels mounted on his outboard and in the carpet of his boat, Troy Lindner has virtually no need to plug his battery charger in once he's off the water. Troy Lindner was in the midst of a cross-country drive early last year with his father, iconic fishing personality Al Lindner, when the idea started to take shape in his head. The elder Lindner, who knew very little about solar energy, responded with intrigue and words of encouragement. �If you can figure that out, go for it,� Al said. When he returned home to southern California, Lindner reached out to solar companies to see if anyone offered anything that could be installed on the deck of a bass boat or possibly on the outboard. It needed to be durable, waterproof and efficient enough to charge 36-volt batteries and an outboard cranking battery. His search came up empty until he came across Ocean Planet Energy, a Maine-based solar company owned by Bruce Schwab. Schwab tipped him off that there was another individual asking the same questions about solar panels and bass boats. Schwab put Lindner in contact with Brian Meyer, an Iowa angler with an automotive background. Meyer was already a couple steps ahead of Lindner in the search for a durable and efficient option to utilize the sun�s rays to charge his boat�s batteries. He'd already outfitted his outboard with a small solar panel that allowed him to trickle-charge his cranking battery while on the water. It wasn�t until Meyer received a curious email from Lindner last summer that the two realized their searches were running on parallel courses. From there, the two struck up a relationship that has resulted in a partnership and the formation of a new company � Solar Performance � which they believe has the chance to reshape how anglers think about renewable, clean energy. Meyer says his �ah ha� moment came while he was fishing the Mississippi River. He was 10 miles upstream from where he launched. He turned the key to crank his outboard and it barely turned over. His initial search for solar options turned up little that would be practical for a bass boat. �The stuff that was out there for solar, in order to put the kind of power into my battery that I needed, the panel would be as big as a car hood,� he said. Eventually, he discovered Solbian, an Italy-based company whose photovoltaic systems have been installed on a variety of racing sailboats to power the boats� electronics and other equipment while they�re underway. Brian Meyer (left) and Lindner were on the search for efficient and durable solar panels for fishing boat applications when their paths crossed. Meyer soon learned the panels are flexible, durable (waterproof) and capable of delivering enough amps to suit the needs of bass boat owners. After installing an array on his bass boat last year, Meyer said he only plugged his on board chargers in twice. The rest of the time, he relied on the solar panels to charge his batteries. �They�re like a silent worker,� Meyer said. 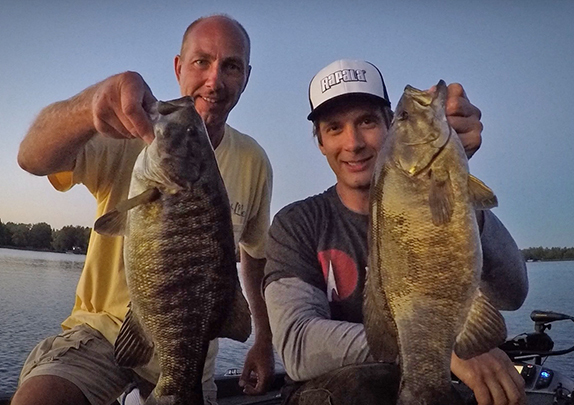 Lindner and Meyer know how tough fishermen can be on their marine batteries. They also know that running them down and then charging them back up equals one full cycle and typical marine batteries will only endure so many charging cycles. Lindner volunteered his Ranger to be a guinea pig of sorts and last year, over July 4th weekend, his boat was at Meyer�s house in Aplington, Iowa, getting outfitted with an array of solar panels. Meyer�s boat was already outfitted with a Power Hood, a flexible, seven-cell panel capable of producing 23 watts of energy that sits atop an outboard motor and connects directly to the cranking battery. It essentially acts as a 2.4-amp battery tender. Lindner got one to put on his Mercury Optimax Pro XS 250. To secure it, the panel is sewn into a vented outboard cover sleeve, made by Texas-based Tuff Skinz, and the sleeve is then secured to the outboard. The panel is equipped with an integrated charge controller that monitors the power output 15 times per second to ensure the cranking battery is receiving a steady charge. In addition to the Power Hood, Lindner had an array of 20 5-inch square cells countersunk into the front deck of his Ranger, just behind the pedestal seat. He also had two eight-cell panels placed on top of the battery compartment lid on the back deck. The panels are waterproof � submersible even � and flexible, and can be customized to fit virtually any configuration. After the floor panels were installed, they were connected to a controller box, which operates in the same fashion as the one connected to the cranking battery only they are connected to batteries that operate the trolling motor, electronics and other equipment. The panels are textured so they do not become slippery when wet. According to testing data Meyer recorded on Sept. 3, 2015 at 1 p.m., the conditions were sunny with a slight haze and 89 degrees. The panels were generating 12.2 amps. The Solar Performance panels installed on the front deck of Lindner's boat are durable enough to stand on and are fully waterproof. With an array of solar panels now on his boat, Lindner no longer has to filter his search for motels to include ones with outdoor electric hookups. Even on rides to and from the lake or sitting in the driveway, provided the boat is uncovered, the batteries can be drawing a charge. They�re also 23-percent efficient, which Meyer says rates above and in some case way above the national average for solar energy. A boat dealer can do panel installations or they can be a DIY project at home. The countersunk floor panels are installed using commercial grade adhesive similar to what is used on automotive moldings. In addition to passive testing through recreational use, Meyer and Lindner have tried to put the solar panels through some harsh testing scenarios. Last year, the two were fishing together on Lindner�s boat and Lindner had his livewell pumps running, all of his electronics on, his trolling motor on high � anything that required battery power was turned on � and thanks to the solar panels, his batteries were able to keep up with the demand and weren�t drawn down. 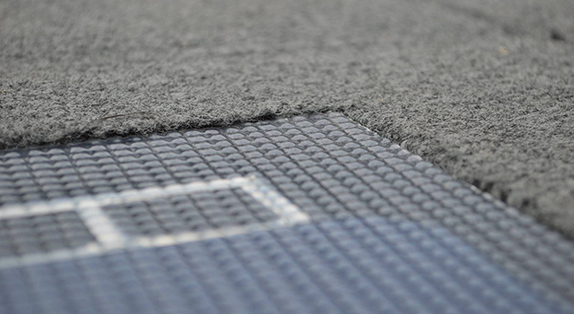 The floor panels are textured to guard against slipping and they're countersunk into the carpet for a sleek, clean finish. The cells are extremely durable, according to Lindner, who has also put them through the rigors of a few tournaments out west over the last year. �I�ve had them for just over a year and the (floor panels) have maybe two scratches and that�s after fishing tournaments and regular use,� he said. �I�ve beat them up pretty good. 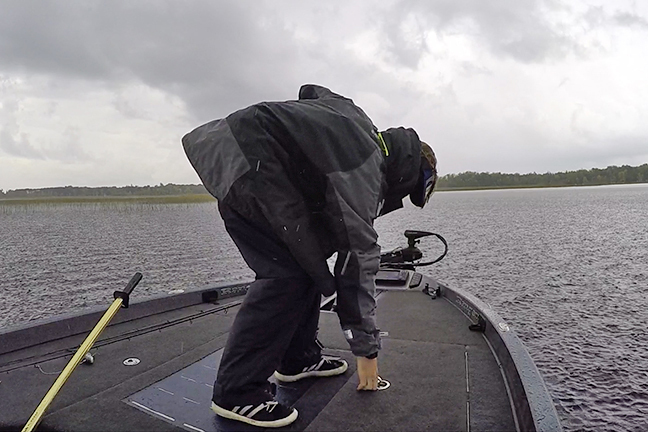 During a Wild West Bass Trail tournament in January at Pleasant Lake, his batteries failed to take a charge overnight between the two tournament days. He had to rely on the solar power generated by the mats to soldier through day 2, when he caught the biggest bag of the day and finished 9th after zeroing on the first day. Lindner is currently leading the points after three events in the Arizona Division of the Wild West Bass Trail. It is Meyer and Lindner�s desire to bring Solar Performance to the forefront of the renewable energy revolution as it relates to the fishing industry. Both believe solar power could be a game changer for anglers. The Power Hood panel cost ranges from $550 to $699 (the Tuff Skinz vented cover is sold separately and can be customized as well). Lindner said to outfit a Ranger with the solar array he has would cost approximately $1,800. Solar Performance also sells a portable panel capable of charging mobile devices via a USB port ($149). The panel can mount to the windshield of a boat via suction cup. Typically, an order can take up to 90 days to be ready, especially for a custom configuration. Meyer and Lindner have sold �a handful� of solar arrays for boats so far, but being a small and new company, they want to proceed at a manageable pace. They hope to have discussions with boat manufacturers in the future about making their solar panels an OEM option. > David Rossow, a Minnesota native, is currently kayaking his way down the Mississippi River from its headwaters to the Gulf of Mexico with a 23-watt Solar Performance panel � it�s the same panel used in the Power Hood � draped across the rear of his kayak to charge his phone and other devices.